He began his studies in piano in 2000 under Zdzisława Rychlewska at the Fryderyk Chopin Music School in Oleśnica. He continued studying the piano at the Ryszard Bukowski Music School in Wrocław where he also began singing lessons under Bogdan Makal. From 2009-2011 he attended the School of Ballet and Dance at the Wrocław Opera. He finished singing studies under Bogan Makal at the Wrocław Academy of Music. Since June 2014 he has been studying at the Academy of Opera at the Grand Theatre National Opera in Warsaw with Eytan Pessen. During season 2016⁄2017 Andrzej was a member of an International Opera Studio in Zurich Opera House. He has had many successes in national and international competitions where he was able to display his distance artistic talents. 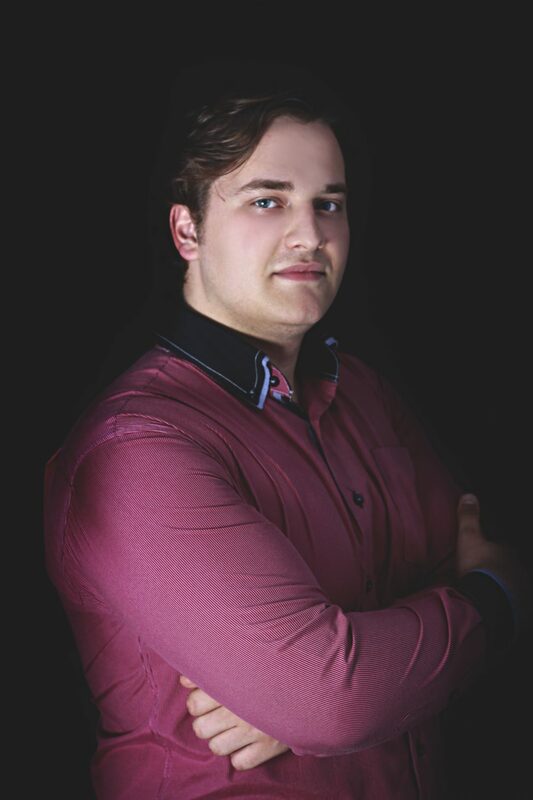 His most important achievements include: first prize at the International Vocal Competition in Petrovice (Czech Republic July 2013), first place in the Barbara Kostrzewska V National Vocal Competition in Rzeszów (Poland November 2013), Grand Prix, first place and the award for best performance of a Polish aria at the XIII National Vocal Competition in Wrocław (Poland April 2014), first place and award for best performance of Polish song in the Krystyna Jamroz VI National Vocal Competition in Kielce (Poland April 2014), Grand Prix, first place, award for best performance of the songs of the twentieth century and Czech Radio award in the Bohuslav Martinu International Vocal Competitio in Prague (Czech Republic October 2014). He won first price and award for the best polish voice in the Stanisław Moniuszko International Vocal Competition in Warsaw (Poland May 2016). In June 2013 and November 2014 he performed a solo in Ariel Ramirez’s Creole Mass at the Wroclaw Philharmonic. He took part each year in the Vratislavia Cantans Festival in Wrocław. He performed a solo from Faure’s Requiem at the Grand Theatre National Opera during the “Crazy Days of Music” Festival in Warsaw. In June 2014 he played the leading role of Simon, in the opera The two fiddlers by Peter Maxwell Davies at the LeoFestiwal in Wrocław. In December 2014 on the New Year’s Eve Gala at Great Theater National Opera in Warsaw he sang the part of William Tell in the finale of the G. Rossini’s opera Willhelm Tell with the orchestra and choir of the Great Theater National Opera under the baton of Andrei Jurkiwicza. 31.01.2015 Andrzej made his opera debut singing the part of Tonio in R. Leoncavallo’s opera Pagliacci at the Stanisław Moniuszko Grand Theatre in Poznan conducted by Gabriel Chmura and won the award for debut of the year with this part. In may 2015 sang part of Il Commisario in G. Puccini’s opera Madame Butterfly and in december 2015 Marullo in G. Verdi’s Rigoletto under the baton of Andei Jurkiewicz at at the Great Theater National Opera. In january 2016 Andrzej made his big debut in part of Onegin in P. Tchaikovsky’s Onegin at the Stanisław Moniuszko Grand Theatre in Poznan conducted by Gabriel Chmura. He took part in G. Puccini’s opera La Boheme in Teatro Lirico in Cagliari as Shaunard under the baton of Michelangelo Mazza (April 2016). In june 2016 Andrzej sang part of Shchelkalov in Musorgski’s Boris Godunov at the Stanisław Moniuszko Grand Theatre in Poznan. During Festspiele 2016 in Salzburg he was a member of Young Singers Project and took part in Massenet’s Thais as Servante. Most recently he sang Silvio in Pagliacci in Teatro Regio di Torino under the baton of Nicola Luisotti (January 2017), Il Barbiere di Siviglia as a title role in Kanazawa under the baton of Marc Minkowski (March 2017), and same part of Barber in Zurich Opera House conducted by Enrique Mazzola (June 2017 and October 2017), Gubetta in Lucrezia Borgia during Salzburg Festspiele 2017 under the baton of Marco Armiliato. His upcoming engagements: Silvio Pagliacci in Covent Garden (December 2017), Lord Gulielmo Cecil Maria Stuarda in Zurich Opera House (April 2018), Marcello La Bohème in Stadttheater Klagenfurt (December 2018) and in Opera Toronto (April 2019), title role of Il Barbiere di Siviglia and Shaunard form La Boheme in Opera Bastille Paris (season 2019⁄2020). He has attended vocal workshops led by Rudolf Piernay (England), Ryland Davis (Wales), Neil Shicoff, Thomas Hampson, Richard Cross (USA), Izabela Kłosińska, Teresa Żylis-Gara (Poland). Andrzej is the recipient of the of the Minister of Culture and Art scholarshipsand Hans und Eugenia Jutting- Stiftung Stipendium.